Children: Children are welcome to attend our 10.30am meeting on the 1st and 3rd Sundays of the month - see below for more information. The Meeting House is next to the Barn Theatre. The early Meeting is held at 8am, lasts for 45 minutes and is followed by a simple breakfast. The 10.30am Meeting lasts for an hour, and is usually followed by coffee. Both Meetings are times of silence, which for some might be an opportunity for thought or meditation, for others prayer. Into this silence from time to time someone may offer a reading or spoken ministry. Children are welcome to attend our 10.30am meeting on the 1st and 3rd Sundays of the month. After the first 15 minutes they are taken out by two adults to a room where things of interest to their age group are explored. We do not indoctrinate, but hope that we can convey something of what Quakers believe, and how that affects our attitude to the world and the way we try to live our lives. • A side room for up to 12 seated (The Friends Room). 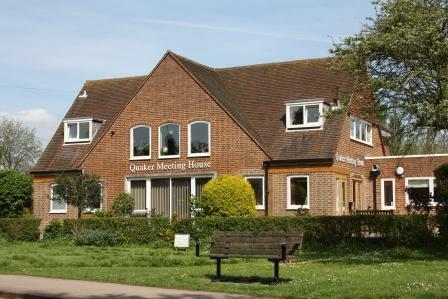 We welcome telephone enquirers to explore whether this is the right venue for you (01707 328 402), or email a question to wgcquakerwardens@gmail.com. Please note, we are now very busy and have only one evening slot available in our main two rooms (Wednesday night from 8pm). If you are seeking a weekly booking, please check our reserved slots before making an enquiry. We do not take one-off or highly irregular bookings. To confirm bookings we require an emailed booking form (in pdf* or word* format), or a signed paper copy if you are unable to provide this via email. This is a non-alcohol venue let on the basis of leaving the venue at least as as well as you find it. We do not take weekend bookings or children’s parties at any times. You may find our nearby Backhouse Room is suitable for these.